VSG is a NIC-level firewall. It’s (logically) inserted between a VM NIC and a vSwitch. Being a NIC-level firewall, VSG has to be a transparent (layer-2) firewall. It has no routing or NAT functionality. VSG is running in a VM (or two of them for redundancy) that can be deployed on vSphere or on Nexus 1010 appliance. The VSG VM doesn’t have to be running in the same hypervisor as the VM it’s protecting (VMware’s vSphere vShield App or Juniper’s vGW require a per-hypervisor VM). VSG depends on Nexus 1000V – Nexus 1000V is the only hypervisor switch (at this moment) that can insert a remote service between a VM NIC and a port group to which the VM NIC is connected. The technology used to insert a service offered by a remote VM between a VM NIC and a port group is called vPath. vPath 1.0 uses layer-2 transport and thus requires a dedicated VLAN between the hypervisor switches and the service VM. vPath 2.0 supposedly runs over VXLAN as well. Initial packets of every session are always redirected to the service VM. After inspecting and approving the session, the service VM can install a 5-tuple shortcut into the hypervisor switch. Subsequent packets of the same session no longer traverse the service VM. vPath service insertion is configured on a Nexus 1000V port-profile (equivalent to vSwitch port group) with the vn-service configuration command. vPath is Cisco’s proprietary technology. It seemed Cisco started to make the technology available to third parties, but let’s wait to see whether Imperva WAF uses vPath or not. That'd probably be the "vShield App"? It's indeed vShield App. Thank you - fixed. The trade-offs depend primarily on what you're protecting. If you're protecting all VMs, and you have a high-end server with tens of VMs, it might make sense to have a per-server firewall VM. If you're protecting only a few VMs per server, less so. Another question is the manageability of VM-per-server solution versus a somewhat more centralized firewall VM. Finally, there's no integration with vCloud Director. vCD doesn't support any of the NIC-level firewalls (including vShield App). Thanks for this Ivan. Nice and compact with some great keys points. 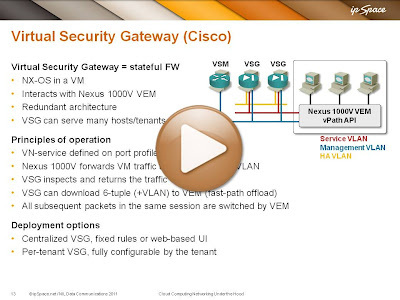 In your sample webinar's dialog, you state that a vGW solution does not scale in multi-tenant solutions, stating a need for one firewall per tenant per host. Not exactly true. The above two limitations can be either worked around with a front-end system that separates logging and allows a RBAC'd interface to vGW with the decently robust API. Not ideal, but certainly an option avoiding the tenancy problem. vGW 5.5, released weeks ago, states you can "split" the interface to service multi-tenancy customers, but I have not tested this yet. If you want to give each customer a firewall they can configure, vGW, vShield App, or any other dvFilter-based firewall doesn't scale. Of course you can always add another layer of abstraction, in our case your own orchestration system (see also RFC 1925, truth 6a). Thanks for this. Very interesting. One question though, maybe I misunderstood (I hope). In the video you were saying that with solutions like Juniper's vGW you need one virtual firewall per virtual machine you want to protect. 20 VMs on one Host = 20 virtual firewalls on the same host. Huh? You sure about that? I hope I said "per tenant" ;) Have to check. If you can use a centrally-configured policy for all VMs on the same hypervisor host, you need a single vGW VM per host. See also the comment made by Jonathan. Actually, VXLAN support was introduced in vPath 1.5, not 2.0 if I'm not mistaken.